As discussed in detail in the first section, equatorial mounts track the night sky to match its motion precisely. Their axes of rotation are Declination and Right Ascension, summarised below. The motion presented by this allows the mounts to track objects in the night sky accounting for their apparent rotation. This allows astrophotographers to enjoy the fruits of long exposures, avoiding field rotation (once precisely aligned to the star Polaris). Life would be easy if this were all there was to it. Unfortunately, by default with just the mount, there is no feedback to tracking. Though the mount has motors that move in Declination and Right Ascension and if aligned well with Polaris, will follow the night sky well, there is nothing in place to tell the mount when it is actually off by a fraction of a centimetre or when it appears to be tracking slightly off the axis of rotation of the Earth. Since there is no feedback system in place to tell the mount when it is veering off course, there is no way the mount can correct this and the process is a runaway process (veering off course more and more with time). What does this mean for long exposures? Simple, star trailing! It seems that though the astrophotographer has ventured into buying an equatorial mount and aligning it well to Polaris, there is still visible star trailing after a while (depending on the quality of the mount's tracking and polar alignment, this can vary between 30 seconds and a few minutes). The problem is worsened when using a long focal length telescope for imaging and the reason behind this is simple - with longer focal lengths comes greater magnification and this therefore accentuates the star trails. The above is a crop from a raw image of the Rosette Nebula, in monochrome Hydrogen-Alpha. It is a 10 minute exposure and though the star trails are not massive (for 10 minutes), they demonstrate how bad tracking can yield star trails, even on an equatorial mount that is built for astrophotography. Naturally if stars are trailing, then the entire image is trailing, and that means reduced detail captured as everything appears smeared. Astrophotographers cannot and will not accept images that show star trailing, especially after the expenses and efforts made to capture stunning images. We note that though different mounts have different capabilities, in general we need to invoke some kind of guiding. Guiding is an age-old technique of providing feedback to the mount to ensure the tracking of the object is spot-on. Conventionally, this was done by placing a second, smaller telescope on top of the telescope being used for imaging and placing a crosshair eyepiece in it. The astrophotographer would then, throughout an exposure, stare at a particular star near the imaging target and if any movement is noticed, slew the mount manually to correct it. After a pattern of how bad the tracking is by itself, it was a fairly easy task of keeping it in check, but extremely tiresome, particularly for very long exposures. There was an issue here, other than being tiresome. It is that the guiding telescope is not identical to the imaging telescope and is generally of shorter focal length. This meant that the guiding telescope may not see star movement (or see extremely little) whereas the imaging telescope would, and would easily capture it in the images. In order to overcome this inherent issue (and to remove the need for a separate, guiding telescope), Off-Axis Guiders (OAGs) were invented. OAGs are a simple accessory that attach to the camera and have a little prism on the edge. This prism is adjusted to be out of the view of the imaging camera but in view of the light coming in through the imaging telescope. The result is that one can stare at stars very near the imaging target through this prism (via an eyepiece), and guide accordingly. This not only removed the need for the second, guiding telescope, but also allowed the astrophotographer to guide at the exact same focal length as is being imaged, matching what the camera is seeing through an eyepiece for guiding. This can also be better logistically, as the OAG can be pointed downwards where the astrophotographer could sit below and guide, whereas the guiding telescope would be too high up to comfortably look through (see above photograph). All these guiding methods are all well and good but they do involve you sitting, looking through an eyepiece and manually slewing the mount to correct tracking. With today's advent of cheap CCD sensors and computer-control, this would not be acceptable, and thankfully this is indeed the case! Nowadays we resort to autoguiding, and this takes advantage of today's CCD cameras and automated computer-control to yield even better results and with the ability for you to sit in your car and enjoy a film while your imaging is done for you! The methods for autoguiding are in fact still the same as with manual guiding - either using a second, guiding telescope on top of the imaging telescope, or using an OAG. 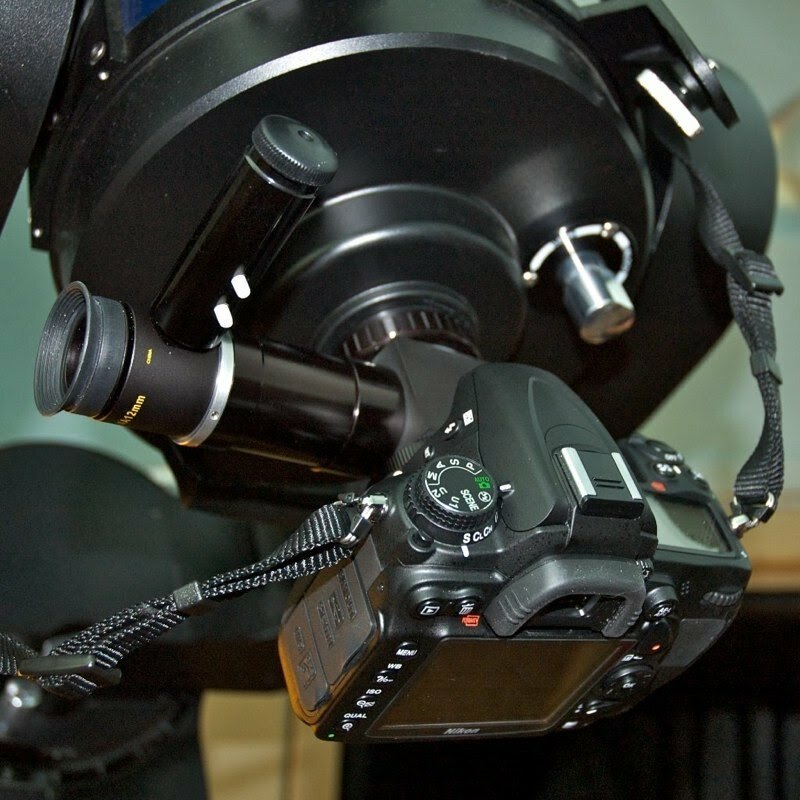 Instead of an eyepiece to look through however, a small CCD camera is placed there, focused and then connected to a laptop. On the laptop, software can be used to continually capture an image through the small CCD camera, lock on to a visible star and track it. This tracking essentially watches the star closely and if any movement is detected, it means the mount's tracking has failed to keep up and the camera (or the software) then sends correction commands to the mount. This is done precisely and with continuous feedback, for as long as the guide star you are locked on to is visible. The above images demonstrate autoguiding with a second, smaller guiding telescope (left) and with an OAG (centre). The image on the right is essentially the software side of autoguiding - the program PHD Guiding locked on to a star visible near the imaging target and constantly monitoring its movement. When movement is detected (seen on the graph), correction commands are sent to the mount to keep tracking on-check. The continuous feedback and automated nature of this system corrects the tracking problems of the equatorial mount in question and allows the astrophotographer to enjoy very long exposures without worrying about star trailing (as long as the polar alignment is decent to begin with and the autoguiding is configured correctly). Moreover, since this system is automated, the astrophotographer is free to enjoy his/her free time while waiting for images to come through. We note that there is a good choice of software for autoguiding, some of which are free (such as PHD Guiding). The method employed for autoguiding is then the user's choice. This can either involve mounting the guiding camera on a guiding telescope or on an OAG. The guiding telescope offers the advantage of a larger field of view (more guide stars to pick), but suffers from different focal length to the imaging telescope (unless the telescopes are matched) and differential flexure - the imaging telescope aiming at a different part of the night sky than the guiding telescope. These disadvantages can yield some star trailing over prolonged exposures as guiding is not 100% precise. The OAG then offers the advantage of no differential flexure and of guiding at the exact same focal length to the imaging as well as not requiring a second telescope (reduced cost and weight, as well as less to carry and set up). The disadvantage of the OAG however is that because it is a small prism, it only picks a small portion of the night sky and this may lack guide stars (unless the guiding camera is ultra-sensitive, as some in the market are!). Choosing the right autoguiding system for the job is not a difficult task as it really boils down to which system you prefer - guiding telescope or OAG. Personally, the latter is preferable, with use of an ultra-sensitive guiding camera. The factors of choice are as follows and summarise what you need to consider when in the market for such a system. 1. Guiding Telescope: This method employs the use of a second telescope, mounted on top of the main, imaging telescope. A guiding camera then plugs into the telescope (in place of an eyepiece), is focused and is controlled via software on a laptop. The advantage of this system is that it provides a large field of view, commonly with many guide stars available (depending on the focal length of the telescope chosen for the job). Disadvantages of this system are that it does mean carrying around a second telescope and having to support its weight on the mount. The focal length of this telescope may also not match that of the imaging telescope and lead to inaccurate guiding. Moreover, the system may end up pointing in a slightly different direction than the imaging telescope and lead to differential flexure. If choosing this method, the guiding telescope needs to have a low focal ratio of around f/5 to have a lot of guide stars available (quick to build image brightness) and a decent focal length of around 400 mm. An 80 mm aperture refractor with a low focal ratio of around f/5 is ideal here. Guide scope rings must also be factored in the cost here as the user must attach the guiding telescope to the main imaging telescope somehow. 2. Off-Axis Guider: This method employs the use of an Off-Axis Guider (OAG), which is a simple, small accessory with a little prism. The prism is adjusted to be out of view of the imaging camera but in view of the light coming in through the imaging telescope. A guiding camera is connected to the OAG to look at guide stars through this prism. The advantages of this system are that the guiding camera is guiding at the exact same focal length as the imaging camera is imaging at, making guiding very precise. There is also no differential flexure to think about as the guiding camera is looking at the same patch of sky as the imaging camera, by definition. Moreover, there is no need for a second telescope or even a finderscope, reducing the weight on the mount and the amount of equipment needed to be carried around and set up. The disadvantage of this system is that the patch of sky visible to the prism is small and can lack in guide stars if the guiding camera is not very sensitive. The OAG can be adjusted to multiple positions around the imaging camera, however. If choosing this method, the OAG should be well built, thin and allow the user to move it around in various positions. The guiding camera should also be as sensitive as possible. 3. Cost, Weight and Size: Since there is such a large difference in weight and size between both methods outlined above, it is worth considering as a factor in its own right. Consider that with the guiding telescope, you will normally have to carry around a 3" aperture refractor (or a 50 mm guide scope, minimum), aside from the guiding camera. This not only means more equipment to carry around, but more to set up and more weight for the mount to support. The OAG however, is a small accessory that can easily be carried in an accessories case alongside the guiding camera and set up with minimal weight added to the mount. Cost-wise, it is important to note that good OAGs actually cost as much as good guiding telescopes (around £100) and so the difference in cost does not lie in this, mainly, but in the guiding camera suitable to the job. OAGs pick off a very small patch of sky for guide stars and this requires the use of an ultra-sensitive guiding camera, which are more costly than guiding cameras suitable for guiding telescopes. With the above information, one should be able to make a more informed decision of the autoguiding system to buy. The following are recommendations to date (01 / 01 / 2014) of autoguiding systems. These vary in price and capabilities and are only some as there are of course more in the market. These come packaged together by Orion as an all-in-one autoguiding system and weigh about 540 g together - the system is very compact. The guiding telescope has a 50 mm aperture, 162 mm focal length and is f/3.2. The focal length is fairly short however and can cause significant differential flexure. The guiding camera is excellent, very easy to use but not very sensitive (though sufficient for this guiding telescope). The guiding telescope is very popular and is an 80 mm aperture, 400 mm focal length, f/5 telescope. The guiding camera is excellent, very easy to use but not very sensitive (though sufficient for this guiding telescope). The guiding telescope is very popular and is an 80 mm aperture, 400 mm focal length, f/5 telescope. The guiding camera is incredible and ultra-sensitive, though a bit low resolution for a guiding telescope. It is also very easy to use. The guiding telescope is very popular and is an 80 mm aperture, 400 mm focal length, f/5 telescope. The guiding camera is incredible and ultra-sensitive (like the Lodestar), with a higher resolution than the Lodestar (more suitable for this guiding telescope). It is also very easy to use. The OAG is one of the world's thinnest OAGs, making is very easy to use and reach focus with. The OAG is very well-built and the prism can be adjusted extensively, and placed in three different angles around the imaging camera (to find suitable guide stars). The guiding camera is incredible and ultra-sensitive. It is also very easy to use. The OAG is very well-built and can be paired perfectly with ATIK's EFW2 filter wheel. The prism can be moved in and out to select guide stars but not around the OAG. The guiding camera is incredible and ultra-sensitive. It is also very easy to use. The OAG is well-built and can be paired perfectly with Starlight Xpress' filter wheel. The prism can be moved in and out as well as rotated around the OAG to find suitable guide stars. The guiding camera is incredible and ultra-sensitive. It is also very easy to use.